Taking backup of the data is really very important either it be on your PC or your mobile. After the advent of the Smartphones people are carrying a lot of valuable data in their mobiles. So it is very much necessary to keep the data present in you mobile at a safe location. If you are having a Windows Mobile then now with the help of Microsoft My Phone you can synchronize the data between your mobile phone and the web. Though the official date has not be announced the service would be available very soon. With Microsoft My Phone you can easily take a back up of your mobile data and save it to to a password-protected web site. You can also access and update your contacts and appointments through your web account. Moreover you can also share photos on your phone with family and friends. Microsoft My Phone service will help you to take a backup of your contacts, calendar appointments, photos, and other vital information present in your mobile. You can even add and modify the data from your web account. 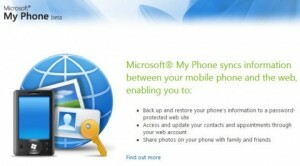 Currently Microsoft is giving you 200 MB of free storage on the Microsoft My Phone web site. Unless you are planning to store many Images; I feel 200MB would be more than enough to store our contacts and messages. You can either use the automatic Sync with My Phone or go for a manual one. Currently, Microsoft My Phone works with Windows Mobile 6+ mobiles.